"They can have their guns or their marijuana, but not both." 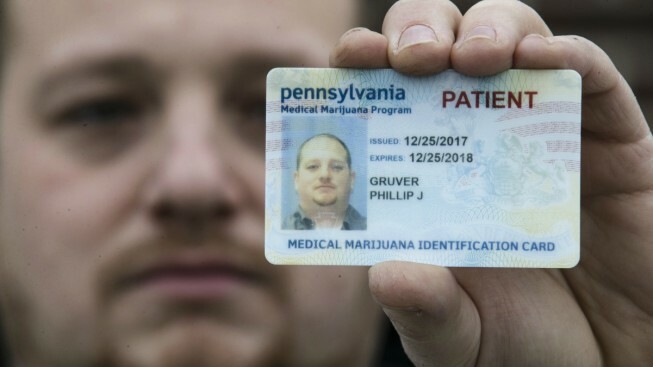 In this Wednesday, Jan. 10, 2018 photo Phil Gruver poses for a photograph with his Pennsylvania with his medical marijuana card in Emmaus, Pa. As gun-loving Pennsylvania becomes the latest state to operate a medical marijuana program, with the first dispensary on track to begin sales next month, authorities are warning patients that federal law bars marijuana users from having guns or ammunition. Gruver is weighing what to do with his .22-caliber rifle and a handgun he keeps for home defense. The federal government says grass and guns don't mix, and that is putting gun owners who use marijuana — and the strongly pro-gun-rights administration of President Donald Trump — in a potentially uncomfortable position. A spokeswoman for the Justice Department referred questions about medical marijuana and guns enforcement to local federal prosecutors and a recent memo from Sessions that does not specifically address the issue.